Bat plant is the common name for Tacca nivea, a tropical evergreen from Malaysia. The name comes from its appearance. Large white petals stand above dark flowers and long bracts and together these make it look like a bat face. In this photo the two petals are not standing up, but are lying on top of the flowers so the look is different, but still striking. I’ll have to go back again at a different time to catch it with standing petals. This one was at Hawaii Tropical Botanical Garden. For more information about Hawaii Tropical Botanical Garden, go to htbg.com. Saffron finches looking for a home? I saw these two saffron finches at Pu’u Wa’awa’a. The one seemed to be checking out a nicely-appointed knot hole in a tree while the other bird sat on a branch offering a different opinion. I don’t know whether they were looking for a nesting site, or the one bird was exploring and the other wasn’t pleased, or something else entirely. I walked on past never to know what the interaction was all about. But sometimes it’s more fun to speculate. Going to the Moon or Mars? Sitting at around 8,200 feet on the northern slope of Mauna Loa, is the HI-SEAS (Hawai’i Space Exploration Analog and Simulation) site. The dome is where a crew of volunteers stays, simulating what could face a similar crew living on Mars. The terrain has similarities to Mars, the crew can only go outside in space suits, and communications are delayed by 20 minutes as they would be in real transmissions between Earth and Mars. Currently, I believe the dome is empty. The last mission, scheduled to run for eight months from February 15, 2018 through October 15, 2018, was canceled after a few days because of some kind of accident, the details of which were never released. The photo on the left shows the approach road to the HI-SEAS site with a near full moon above. Public access to the site is not allowed for obvious reasons, but I do think it would be great fun to dress the kids up as little green Martians and take them trick or treating there. Imagine being inside the dome when there’s a knock on the door. For more information about HI-SEAS, go to hi-seas.org/. How long is a zebra moray eel? Zebra moray eels are one of the easiest eels to identify, their circular stripes differentiating them from any other eel. They feed mostly on crabs, which they crush with their blunt teeth. These eels can grow to five feet in length, but are usually smaller. This one though is probably about as large as they get. The yellow tang near its head could be as long as six or seven inches, while the saddle wrasse at its tail tops out at ten inches. That would make this eel somewhere between four and five feet long. It’s certainly the biggest zebra moray that I’ve seen. A green anole looking for its keys? Something about how this green anole is hanging on to the leaf, and its expression — a touch of frustration and resignation — made me imagine it was looking for something, lost keys perhaps, or that bug it had stashed for later. Northeast trade winds are Hawaii’s air conditioner, moderating what would otherwise be much hotter temperatures. The North Kohala coast is a spot where the winds whistle ashore. They can be very strong, but if you want to know how strong, the surest way is to ask a tree. This one is near the Kauhola Point light. Posted in response to this week’s Sunday Stills challenge on the theme of ‘Wind.’ See more responses here. 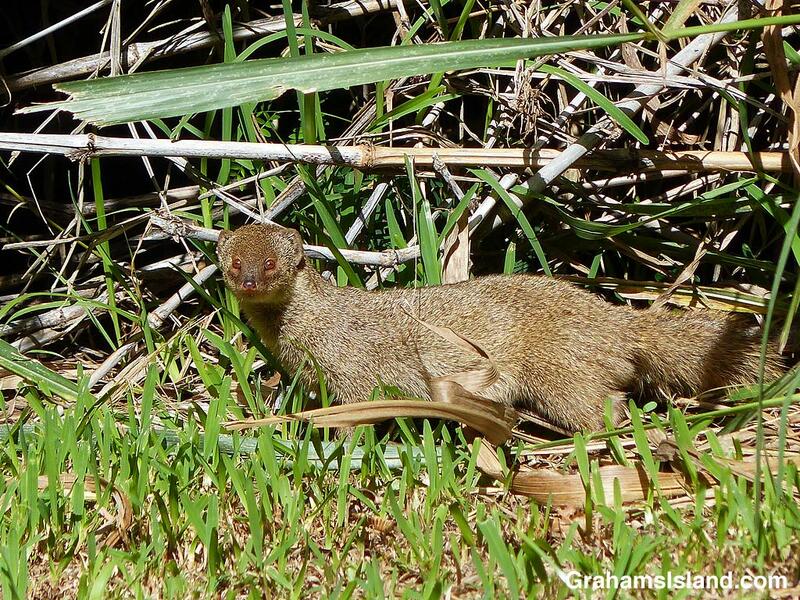 I saw this mongoose one morning, standing in the sunlight at the edge of the yard. It noticed me, of course, but remained in place for a while before disappearing. After I went indoors again, I looked out of the window and it was back, soaking up the rays.